Customer experience management provider Sitecore has launched Sitecore Experience Platform 8. The latest version enables marketers to create, deliver and optimise unique digital experiences with their prospects and customers throughout the customer lifecycle. The Sitecore Experience Platform (Sitecore XP) helps marketers build an Experience Profile for every customer, by collecting and connecting data across all digital and offline channels, to provide organisations with complete profiles of the individual people who are interacting with their brand; and helps shape every experience with those individuals, across all digital channels. Today’s disconnected marketing systems prevent marketers from delivering optimal customer experiences, as the data they need is scattered across multiple systems. Marketers are spending far too much time piecing together disparate customer information, hindering their efforts to deliver great experience marketing. This has resulted in inconsistent and fragmented customer engagement. Sitecore XP 8 shortens the time it takes to gain insights, make a decision and take action. Data analytics is built in, giving marketers constant feedback on content effectiveness and performance, and recommending actions accordingly. Automatic testing and continuous content optimisation ensures everything can be constantly refined and improved. The Experience Profile can be used immediately to segment and target audiences using any demographic and behavioral information collected by Sitecore, to personalise individual content and offers, in real time. Sitecore XP 8 was initially made available as a technical preview at Sitecore Symposium in Las Vegas on September 9. Since then, more than 300 Sitecore customers and partners have participated in the technical preview. Feedback on the new user interface and the simplified marketing automation capabilities has been glowing. Brand New Interface: Sitecore XP 8 has a completely new user interface, providing a clean, consistent user experience for every Sitecore user. This makes learning to use Sitecore much quicker and easier, and lowers training and support costs. Because every feature works in the same way, marketers can easily master all aspects of digital experience marketing within Sitecore. Single Customer View: The Sitecore Experience Profile provides a single view of each individual customer, used for real time personalisation, segmentation and analytics. Sitecore collects and connects data about the whole customer experience, wherever it happens, making it immediately available to marketers to continue ongoing conversations and provide highly relevant and personalized experiences for their customers. Pervasive Analytics & Insights: Sitecore XP 8 shortens the time it takes to gain insights, make a decision and take action. Sitecore uses Engagement Value to measure what’s working, what’s not, and recommends what action to take, throughout Sitecore’s Experience Marketing tools. 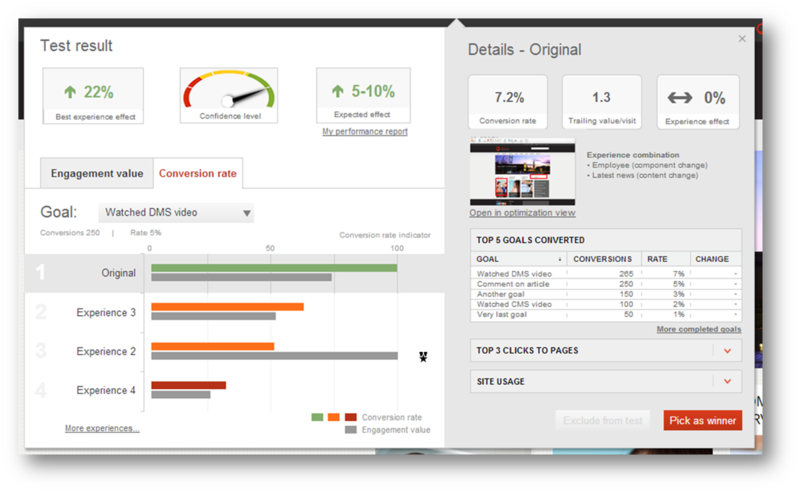 Sitecore’s Experience Analytics help marketers understand what is performing, and with whom. Sitecore also harnesses and analyses data from non-Sitecore sites, CRM, ERP, and POS systems. Continuous Testing & Optimisation: With Sitecore XP 8, everything can be optimised. All content changes can now be automatically A/B tested, by any content creator. Personalised content can be tested against its default control base content. Advanced optimisation experts also have all the tools they need to set up sophisticated test scenarios, like multi-variate tests, built into the platform. So every component and every channel can be fine-tuned for performance, continuously. Dynamic Segmentation & Automation: Sitecore enables target segments to be created based on any information in the Experience Profile – like demographic data and behaviour – for real-time content personalisation, email communication and automated nurturing campaigns. Segments are directly usable with Sitecore’s automation and email marketing capabilities. Cross-channel Experience Delivery: Sitecore customers can now use Sitecore as a central hub to manage all of their digital properties, even non-Sitecore sites. New customers can start to leverage Sitecore functionality immediately on existing sites, and marketers inheriting legacy sites can rapidly bring them under the brand umbrella.